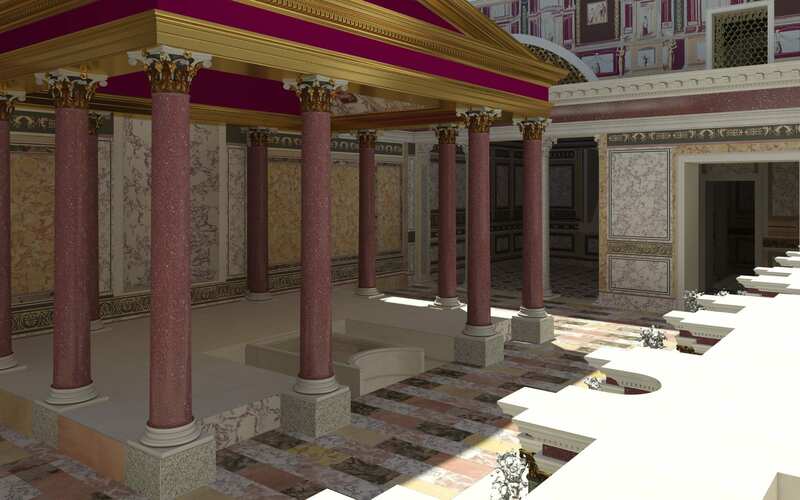 Nero was so closely associated with his insanely huge Golden Palace on the Oppian Hill that his previous abode, the Domus Transitoria, was entirely eclipsed by its successor. It was called the Transit House because it extended from the Esquiline to the Palatine so the imperial family could move from one hill to the other moving solely through the buildings, gardens and pools of his private 9,000 square foot palace. It too was constructed of opulent materials from patrician estates that had gradually fallen into imperial hands and was considered obscenely luxurious when it was built in the 50s A.D. It burned down in fire of 64 A.D. and Nero took advantage of the destruction of large swaths of the city to build the Domus Aurea by way of replacement. The first remains of the Domus Transitoria were discovered in 1721 by the noble Farnese family. 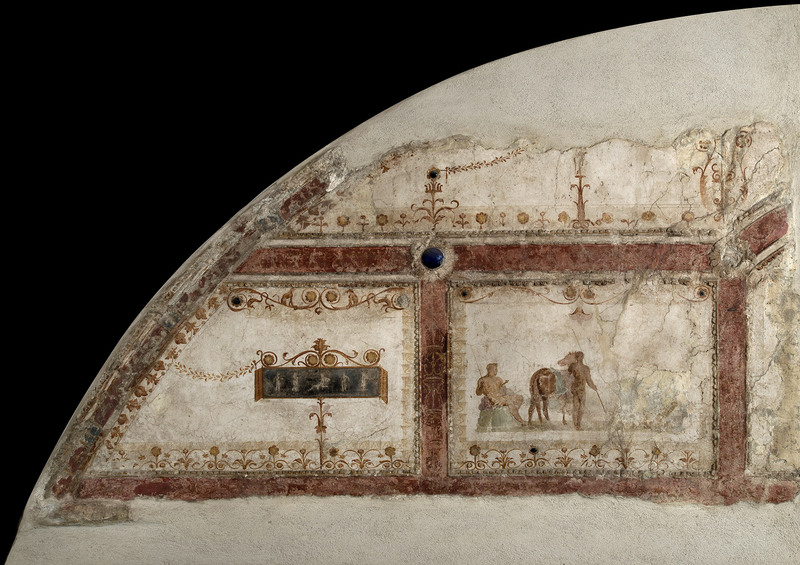 Like with the Domus Aurea, it was the surviving frescoes that caught the eye, their small fantastical details inspiring artists in the grottesque style. The Farnese helped themselves to whatever they wanted and what they wanted was those frescoes. They were chiseled off the walls and wound up in the collection of the Archaeological Museum of Naples. Most of what’s left of the palace — a triclium surrounded by porphyry columns, opus sectile floors, vaulted ceilings, an elegant nymphaeum, a communal latrine facility that sat 50 and is believed to have been built for the work crews who built the Domus Aurea after the fire — was excavated by Giacomo Boni in the 1910s. The Domus Transitoria has never been open to visitors before, but after a decade-long program of structural reinforcement and renovation, you can now descend into the ruins of palatial rooms and gardens that were once ground level. As with the phenomenal Domus Aurea tour, there’s a virtual reality component here too. Visitors receive virtual reality goggles which bring the dank chambers to life, showing them as they were 2,000 years ago – part of a huge palace decorated with marble pillars, lavish frescoes, mosaic floors and fountains. The walls were painted with garden scenes, including trees, flowers and song birds. Inspiration for the design of the sumptuous residence came from a palace built for the Egyptian pharaoh Ptolemy in Alexandria, said Alfonsina Russo, the director of the archeological zone that encompasses the Roman Forum, the Colosseum and the Palatine Hill. “It reflects the personality of Nero, one of the most controversial figures of the Roman Empire,” said Prof Russo. The Archaeological Museum of Naples has loaned the frescoes looted from the palace in the 18th century for the reopening. The Palatine Museum just a few steps away has a few frescoes of its own removed in the 1950s as well as statues and other decorative pieces recovered from the Domus Transitoria. 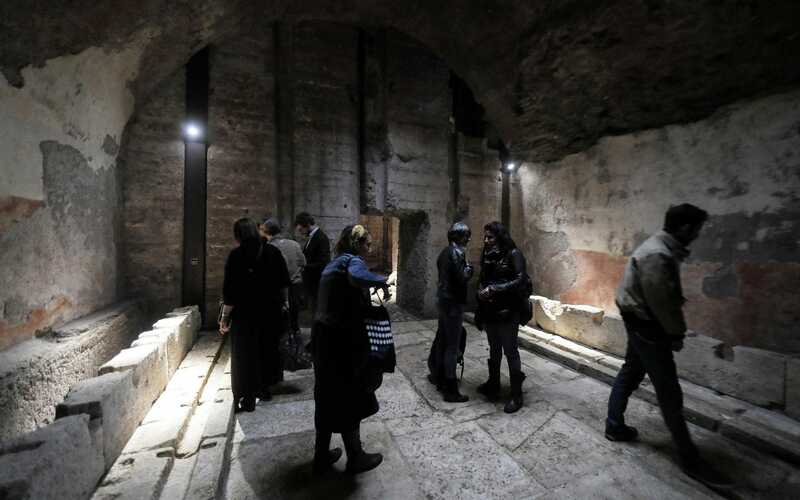 The tour of the Domus is included in the new Roman Forum-Palatine ticket (16 euro) which is valid for a day. The Domus Transitoria can only be visited from Friday to Monday. 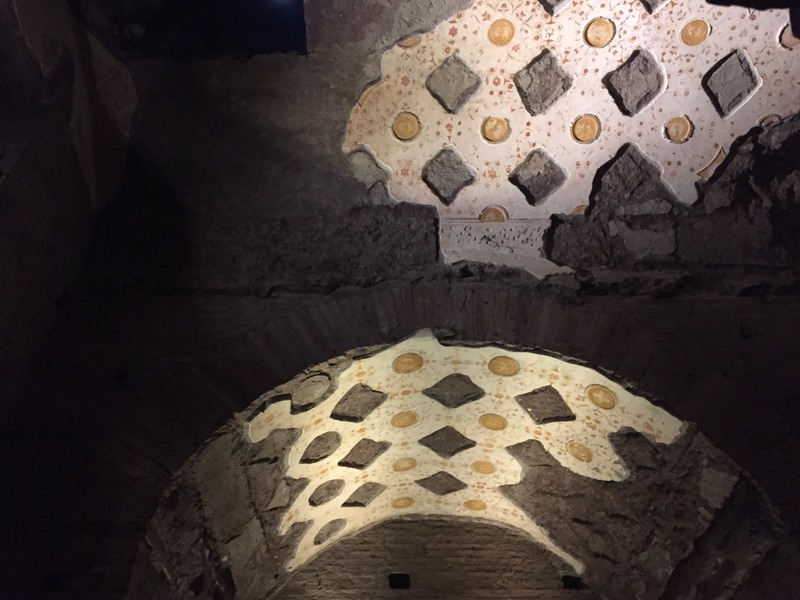 Included in the price of the ticket is entry to the Palatine Museum, the Neronian Cryptoporticus, the Domus of Augustus, the Domus of Livia, the Temple of Romulus, Santa Maria Antiqua and the imperial ramp of Domitian. You have no idea how hard I tried to get into Santa Maria Antiqua and Domitian’s ramp my last two visits to Rome. No one’s keeping me away next time. This entry was posted on Saturday, April 13th, 2019 at 11:53 PM	and is filed under Ancient, Museums, Roma, Caput Mundi. You can follow any responses to this entry through the RSS 2.0 feed. You can skip to the end and leave a response. Pinging is currently not allowed. 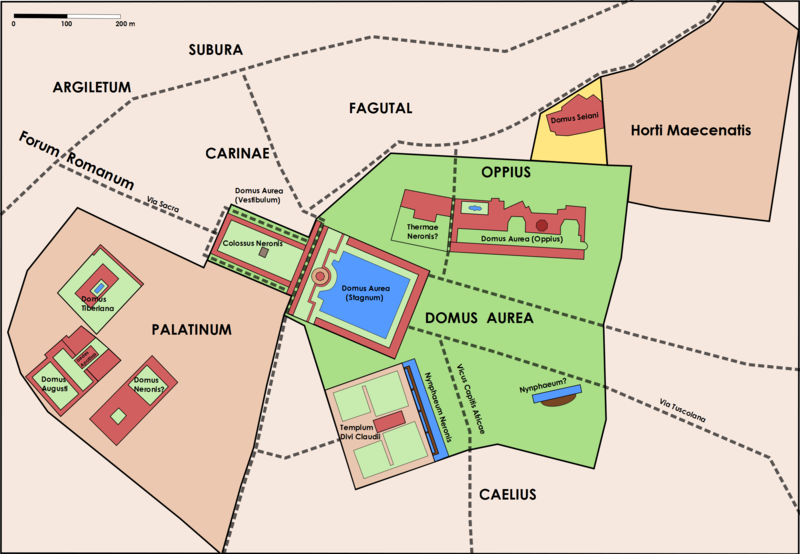 Unfortunately, I never made it to Rome myself, but there is a plan that illustrates the Palatine hill, the ‘Via Sacra’ with the Forum Romanum, the ‘Horti of Maecenas’ on the Esquilin hill [near the ‘Via Mecenate’? ], and that the ‘D. 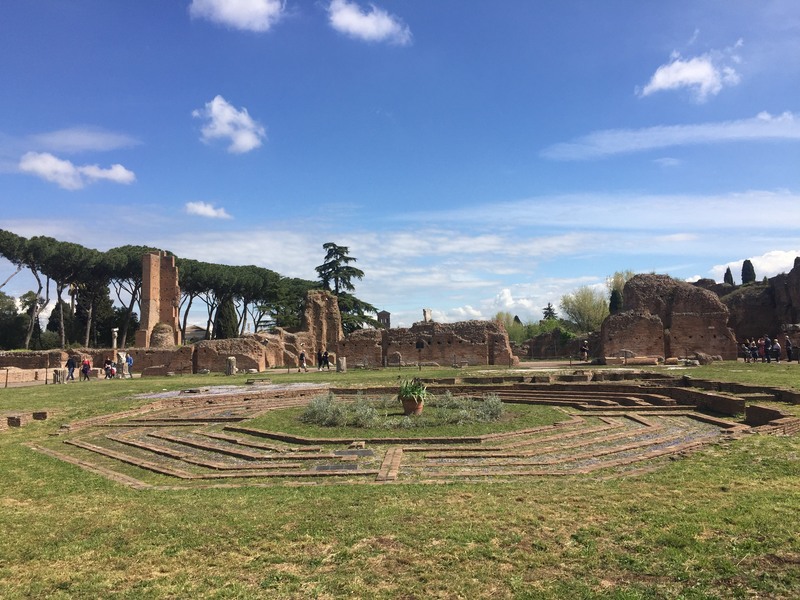 Transitoria’ was connecting to, the ‘Domus Aureus’, also, roughly where the ‘Stagnum’ water pond is on the ‘plan’, there is currently what is left of the ‘Colosseum’ (cf. : 12° 29′ 33,1″E, 41° 53′ 26,0″N). Besides, the ‘Vasari Corridor’ (‘Corridoio Vasariano’) is an elevated enclosed passageway in Florence, which connects the ‘Palazzo Vecchio’ with the ‘Palazzo Pitti’ over ~900m, built to the design of Giorgio Vasari in five months by order of Duke Cosimo I de’ Medici in 1565. Vasari did spent time in Rome, and it’S hard to tell if he knew about the ‘Domus Transitoria’, but apparently he designed one. Seats 50?!! They could have a pot party!! I am impressed with size of ancient communal latrines I have seen, especially here in Israel, but never 50! Who is working when 50 are ..,,,, not ?